Born 5.01.1961 in Wrocław, made his debut in 1977. In 1978 he received special mention, and in 1980 he received the second prize at the Jazz on the Odra festival. In 1984 he won the Grand Prix at the San Sebastian “Jazz Aldia” in Spain. He received his Master of Arts degree from the Karol Lipiński Academy of Music in Wrocław. During his forty years of musical activity, Piotr Baron has collaborated with the most outstanding artists from Poland, Europe and the USA: Zbigniew Namysłowski, Tomasz Stańko, Henryk Majewski, Henryk Miśkiewicz, Jarosław Śmietana, Wojciech Karolak, Zbigniew Lewandowski, Kazimierz Jonkisz, Krzesimir Dębski, Janusz Muniak, Tomasz Szukalski, Darek “Oles” Oleszkiewicz, Piotr Wojtasik, Jan Ptaszyn Wróblewski, Bo Stief, Jasper Van‘t Hof, Ray Charles, Art Farmer, James Newton, Al Porcino, Billy Harper, David Murray, Kevin Mahogany, Victor Lewis, Roy McCurdy, John Hicks, Jon Mayer, Eddie Henderson, Gary Smulyan, Marvin “Smitty” Smith, Carter Jefferson, Bobby Watson, Kei Akagi, Larry Koonse, Joe LaBarbera, Charlie Shoemake, Mark Soskin, Kevin Hays, Billy Hart, Harvie Swartz, David Friesen, Clarence Seay, Ed Schuller, John Betsch, Wadada Leo Smith, Ronnie Burrage, Greg Bandy, Malcolm Pinson, Skip Hadden, Steve McCraven, Wayne Bartlett, Carlos Johnson, Karen Edwards. In 1998, he was the concertmaster (first alto saxophone) of the European Broadcasting Union Big Band Orchestra in Stockholm. He has taken part in a number of jazz and classical music projects, including Cezary Duchnowski’s Monads series, Jacek Niedziela-Meira’s Scenes from Macondo symphonic poem, and Krzysztof Herdzin’s Looking for Balance suite. He has taken part in the recording of about 100 albums, among others Traveling Birds Quintet (1994) and Return to the Nest (1995) of the same ensemble. Piotr Baron has recorded nine original albums: Take One (1995), Tango (1996), Blue Rain (1997), Bogurodzica (2000), Reference (2004), Salve Regina (2007), Sanctus, Sanctus, Sanctus (2008), Kaddish (2008) (2011) and Jazz na Hrade (2012). For a quarter of a century now, he has been at the top of the “Jazz Top” survey of the “Jazz Forum” magazine, the winner of this category in 2015 in the baritone saxophone category. Nominated for the Fryderyk award as musician of the year in 2000, 2004 and 2009, with Bogurodzica and Sanctus, Sanctus, Sanctus receiving nominations for album of the year. Piotr Baron is an artist at Cannonball Musical Instruments, Drake Mouthpieces and D’Addario Woodwinds. He was awarded the bronze medal “Gloria Artis”, the medal “Meritorious for Wrocław” and the “Golden Badge” of the Jagiellonian University. He is a composer of music for theatres (including the Wrocław Puppet Theatre, the National Old Theatre in Kraków, the Słupski Dramatyczny Theatre, the Wrocław Contemporary Theatre). 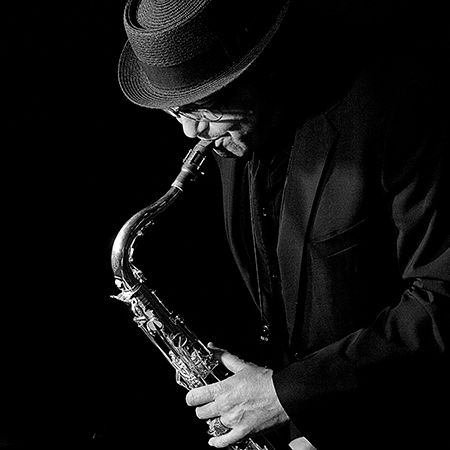 He worked as a teacher and lecturer of saxophone, jazz harmony and improvisation at the Jazz Institute of the State Higher Vocational School in Nysa, at the Wrocław Jazz and Entertainment Music School, as well as at the IKSM Jazz programme at the University of Zielona Góra. He conducted open jazz lectures in the US at the University of California Irvine, California Institute of the Arts in Valencia, in Turkey at the Ankara Bilkent University, in Austria at the Kunst Universitaet Graz, and taught at summer jazz workshops in Prague, Lviv and many Polish cities. From 1994 to 2011, he hosted his own show on Polish Radio Wrocław, and from 2012 to today on radioJAZZ.fm. He is a reviewer and publicist (including “Jazz Forum”) and the author of several scientific publications. From December 2015 to August 2018, he worked at the Ministry of Culture and National Heritage as an advisor to the Undersecretary of State and Deputy Head of the Department. In September 2018, he was appointed director of the Polish Sinfonia Iuventus Orchestra.